INTRODUCTION: The desire to reduce incision related post-operative morbidity and pain while achieving improved cosmetic results has recently led to the introduction of less invasive techniques. In this respect, single incision laparoscopic surgery (SILS) is an attractive option. One of the major criticisms of SILS is that the vision is impaired and therefore the safety of the procedure is compromised. Herein we present our initial experience of SILS using dedicated instruments and new techniques for maintaining the same high level of safety. METHODS: SILS was performed on 50 patients at our institution during a period of 18 months. The procedures performed were 28 cholecystectomies, 12 appendectomies and 10 LAGBs. Low profile trocars, articulating laparoscopic instruments and endoretractors were used to overcome the technical pitfalls accompanying this approach. No special trocars for SILS were used. RESULTS: SILS was successfully performed in 27 of 28 cholecystectomies (97%), 9 of 10 LAGBs (90%) and in all 12 appendectomies (100%). One patient had an intra-hepatic gallbladder with overlaying left lateral liver lobe which necessitated two additional trocars to achieve satisfactory retraction. The second converted procedure was of a patient who had a LAGB which needed an additional trocar for a better view of the retrogastric tunnel and resulted in modifying our technique in the following LAGB procedures. The operative technique for all procedures was modified along our learning curve. Endoretractors contributed greatly to achieve better retraction and exposure for comparable safety. The operative time decreased rapidly following the determination of the technique (cholecystectomy from 230 to 50 minutes). There were no significant morbidity and no mortality. CONCLUSION: SILS can be safely performed when using appropriate instruments and dedicated tools. 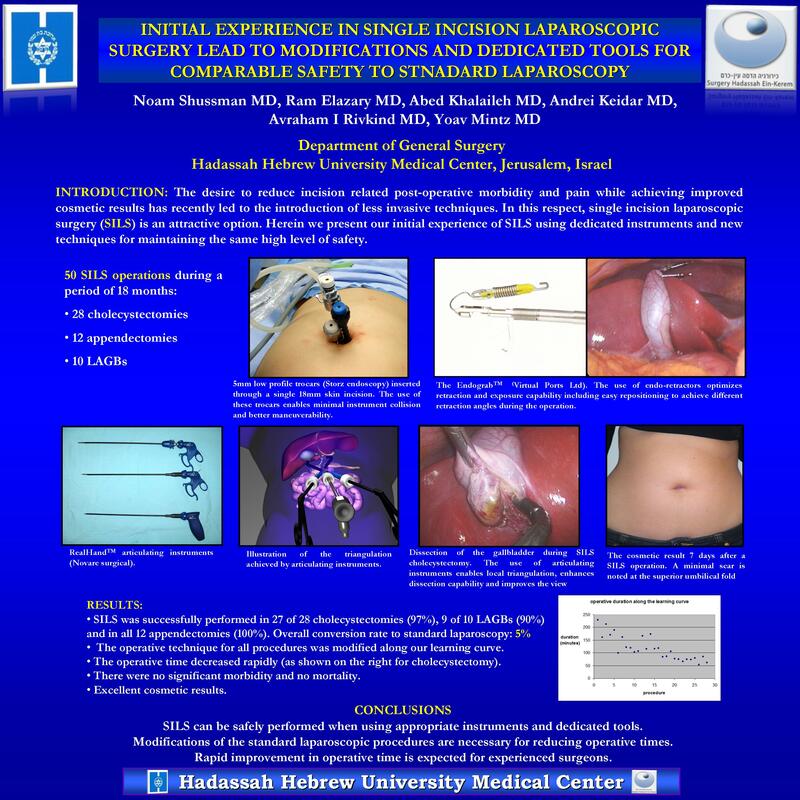 Modifications of the standard laparoscopic procedures are necessary for reducing operative times. Rapid improvement in operative time is expected for experienced surgeons.